Tour Dubai with a private guide for just you and your party, including a visit to the Burj Khalifa, then cap off the experience with cocktails in the luxe Burj Al Arab's Sky View Bar. Round-trip private transportation from your Abu Dhabi hotel included. 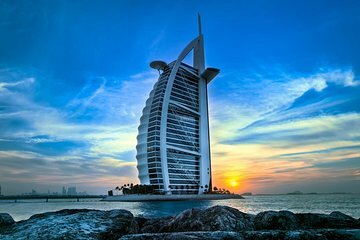 Enjoy new Dubai’s sights and drinks at the Burj Al Arab in style with this private round-trip from Abu Dhabi. This 11-hour tour from Abu Dhabi begins with pickup at your hotel at the agreed-upon time. In a private tour vehicle, set out for a full day of adventure in Dubai and leave the driving to the experts. Begin in Dubai's modern sector, by visiting the man-made Palm Island Jumeirah, then to through the underwater tunnel to the Atlantis, the Palm. Spend some time exploring and taking photos of the hotel before continuing to the Dubai Marina, where you can walk along the water and admire the Dubai skyline, featuring more than 260 skyscrapers. Explore the Souk Madinat Jumeirah, modeled after a lagoon city, and the lively Souk Madinat. Snap photos of the sun setting from the vantage point of the Dubai Mall and the Burj Khalifa. Hop the high-speed elevator to the 124th floor and spend some time enjoying the incredible views. On the way out, watch the water fountains and then head for the Burj Al Arab. Walk through the atrium lobby to the glass elevator, which will whisk you to the sky bar on the 27th floor. In the bar, drinks of a value up to 95 USD are included. At the conclusion of your tour, return to Abu Dhabi for hotel drop-off.